We had the opportunity to work with Get Sharp, Inc. and Stratus Concept, both from the Chicago area, on this large scale web development project. 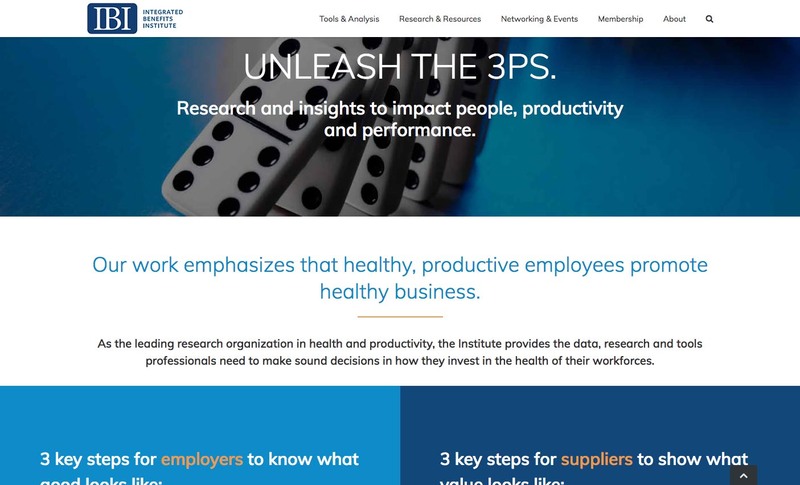 Integrated Benefits Institute, based out of San Francisco, is a research organization providing data, research and tools so that human resource departments can make sound decisions in how they invest in the health of their workforces. The website content was migrated from their old ExpressionEngine website into WordPress, the site was re-organized and redesigned from the ground up. The project included theme and plugin customizations. Custom add-ons included SalesForce integration with membership registration, a filterable media library, and an events calendar with event registration.